The IOR will hold its annual conference in Birmingham on June 12. Are you a current or former female apprentice? The Women in RACHP needs YOU! Come and help us showcasing the benefits of RACHP apprenticeships! Cool Talks and the IOR Regional Northern Branch dinner will be held in Yorkshire in the coming months. The IOR has just launched its updated version of the handbook. Applications to the board are now open! The EFCTC (European FluorCarbon Trading Council) has set up a website to report any illegal activities related to refrigerant import and sales activity in Europe. The Integrity Line, operated on EFCTC’s behalf by the EQS Group, promises that anyone will now be able to report suspicious activities easily and if necessary, in confidence. Calling all female working in RACHP to become an IOR member. 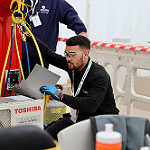 Orlando Rawlings from Daikin UK was selected to represent Team UK at the WorldSkills International Competition in Russia. Why don't more people install heat pumps? The IOR is organising a Midlands Regional Meeting and TechTalk to provide answers to this current issue.